Social Media is a Terrible Ecommerce Tactic - or is it? Social Media is a Terrible Ecommerce Tactic – or is it? Each quarter, ecommerce optimization firm Monetate publishes a report that analyzes traffic and conversion efficacy on thousands of leading e-retail websites. The report for the first quarter of 2013 peered into more than 500 million online shopping browser sessions. The results were shocking. It might be reasonable to conclude, therefore, that social media participation is over-hyped and disproportionately resourced for ecommerce websites. And from the perspective of “What channel were people using immediately prior to visiting the website?” that would be a viable hypothesis. 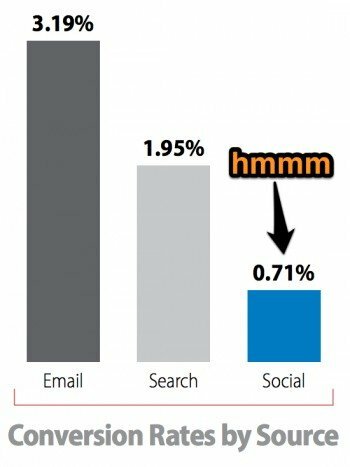 Is social ineffective or just invisible? But the challenge for social media—and for word of mouth marketing—is that they are inherently additive pieces of the conversion funnel, rather than causative. Forrester Research suggests that word of mouth is part of 80% of all purchase funnels. At least some of this word of mouth is occurring via social media, with brand or product mentions spawning searches and/or direct URL entries that are included in this data. But, because social media wasn’t the final link in the chain, it gets none of the credit for the desirable consumer behavior it spurred. Here’s an example of the role of social as a reputational and awareness assistant. My friend Ann Handley of MarketingProfs asked a question of her Facebook friends about a reliable source for contact lenses. 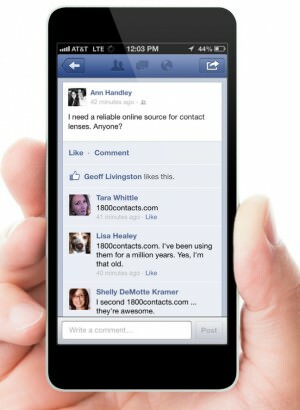 Several recommendations surfaced for 1800Contacts.com. At this point, if Ann went to her browser, typed in the URL, and made a purchase, full credit for that transaction would accrue to the direct channel. Similarly, if you recommend a hockey supply store to me at my son’s game, and I Google it to find the URL when I get home, is that a visit from search, or a visit due to word of mouth? New research from Google shows that social media is very much an awareness-building vehicle, and less so a purchase-driving tactic. In fact, of all the online behaviors studied by Google—which are almost identical to those examined by Monetate—social media is the second “earliest” (after only clicks on display advertising) in the average U.S. consumer’s purchase path. Maybe it’s a sequencing problem? Given the extreme stickiness of social networks (especially Facebook and Pinterest), it is indeed possible that part of the issue with social commerce is one of session interruption, whereby consumers don’t want to leave the visceral comforts of their social network by clicking a link and going shopping online, but would rather store the awareness of the deal in their noggin and visit the website later, when they are less ensconced in social media bliss. This, of course, would culminate in a website visit from the direct source, with no credit accrued to the ignition source of social. Certainly on its face, the data in this Monetate report (which I really suggest you download) looks a little gloomy for social media as a revenue producer. Maybe that’s so. But I refuse to believe that all of our posting, sharing, and liking isn’t at least contributing to ecommerce traffic and sales, considering that we spend more time on social media than on web browsing and email combined. The trick is proving it, which is why I very much recommend that website owners utilize the “Assisted Conversions” feature of Google Analytics (or similar functionality from another analytics platform) to better understand the entirety of the funnel and the evermore complicated interplay between the panoply of digital marketing and offline channels.